Many LNC”s will review cases for all specialties. Most are conversant with the differences between medical and surgical cases. Except, that is, when it comes to kids. Many of the “rules” of adult medicine go out the window in Pediatric cases. Pediatric cases are fewer in number, but much higher in average payout , thus it is incumbent on those reviewers working for both sides to be familiar with these differences. Dr. Lessin will go over why kids are different from adults and how it impacts case evaluation. 1. Attendees will learn specific differences between children and adults when reviewing cases. 2. Attendees will learn approaches to case review specific to children. 3. 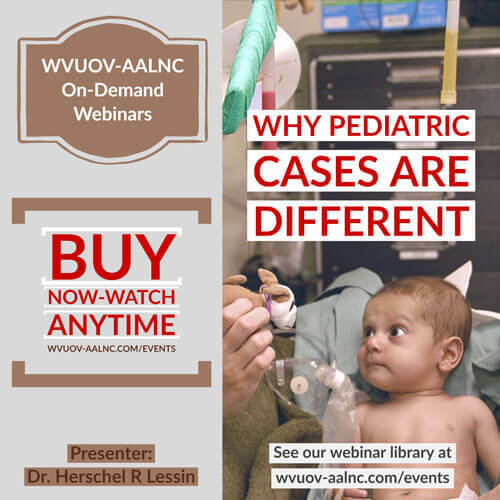 Attendees will learn why it is important to obtain specific Pediatric expertise when evaluating a case.